Olsson started out at the age of 12 picking lingonberries in the vast forests of northern Sweden just so she could buy her very own first horse. Which by the way ended up being a two-and-a-half year old SWB mare that surprised everyone with delivering a foal by a pony stallion! Fast forward.... As we all know, becoming a successful breeder doesn’t happen overnight, there are decades of hard work behind the successful horses she is reaping the rewards for today. Christina Olsson received her MSc degree in equine science at the Swedish University of Agricultural Sciences, a pioneer already, insisting on creating her own curriculum with equine studies in focus at a time when Animal Science was all about the production animals; cows, pigs and chickens. Over the years she has carved out the passion for horses in her professional life as well as in her free time. These days work and free time typically go hand-in-hand, as her day job is as director of the breeding department of the Swedish Trotting Association. Other than that, she is also the head of the stallion committee for the Swedish Trotting Association, and a member of the stallion committee for the Swedish Jockey Club. In the sport horse world, she has held the position of president of the SWB stallion committee for many years. A position that ties well in to her passion for breeding dressage horses. To date, Christina Olsson is the breeder of more than 6o horses. On average she breeds two to four mares per year, with many of her breedings being very successful in competition up to the highest level. She has sold horses to Norway, the USA and the Netherlands, where they all have performed successfully. 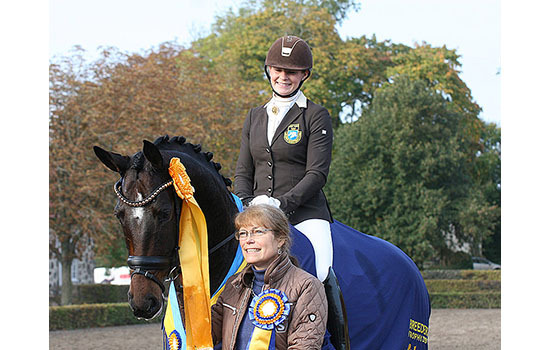 She has not limited herself to only dressage breeding, however, because a few of her horses have also been jumpers competing successfully up to S class. In 2018 her mares Astoria (SWB) born 2012 by Sir Donnerhall II x Aquarell x Quaterback, and Athena (SWB) born 2013 by Tailormade Temptation x Miami x Master, both won the Breeders Trophy (SWB Young Horse Championships), respectively. Both mares also represented SWB in the dressage World Breeding Championship for Young Horses in Ermelo the same year, Astoria making her second consecutive appearance. These two mares are her most recent successful horses, currently winning most everything as young horses. However Olsson’s goal for any of her horses is to reach the FEI level in competition. Q After all your success; What is your goal in breeding today?